Meade LT-8 SC, 2x Barlow Meade 4000 series, DSLR Canon EOS 600D, ISO 400, 1/40", 50 frames of 1000. 00:00 MSK (20:00 UTC) 12/11 April 2014, my balcony. Russian Federation, Saratov (51º30' N 46º02' E). 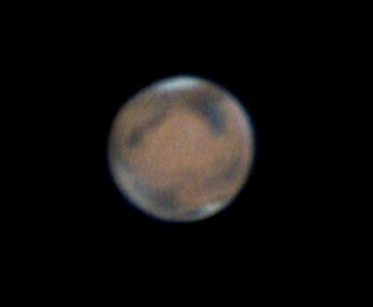 As elusive as Mars had been for me so far this pass, I think your picture is great! Thank you for sharing it! All pics were made by Canon EOS 600D cam. Good shots of the Orion Nebula and Jupiter. The Jupiter shot lets me know what I can expect to see visually with my scope. I like your dew shield! In your weather, that seems to me would be absolutely necessary. My dewshield is totally DIY, I used pressed paper and stick tape so it was extremely cheap - but it works well and I can easily fold it for the transportation. Without a dewshield a corrector lens very quickly covers with moisture - or, if to say about autumn/winter/spring, with a frost. Absolutely necessary accessoire for LT-8, yeah... As for Jupiter's pics - I suspect I can get some better results, but I need Jupiter to be higher in the sky. On my latitude (~ +52 degrees) planets rarely get really high so the image usually strongly suffers from the atmosphere chromatism. I always need to use RGB layers correction in Registax to get better results (example: http://astrodummies....low_test/3-0-77). Just have returned from the Caucasus mountains. Never have yet took pictures on the 10 000 feet height. Here are some results (Meade LT-8, Canon EOS 600D, 30 s exp, 12800 ISO, noise correction in DSI, curves correction in GIMP): M8, M27, M82 and NGC7009 nebulas. Wow! Those are really nice! I thought about you last week sometime and wondered what you were up to. Looks like you were up to a lot! The LT and LS scope framework was not built with imaging in mind, more along the lines of portability, but they still seem to do a pretty good job. I think of M-27 as being the "Apple Core Nebula." M-82 is one of my favorites. It is a real challenge object for me with a small scope. I was able to see the supernova in it a year or so ago, while it was at Mag 11, with a 60 mm refractor from my suburban back yard. I am so proud of that simple accomplishment that it seems silly to me. I travelled with a small group of Russian amateur astronomers, we set up our camp in the Shaukam mountain pass (430 N 420 E). The weather is really unstable there and nights are really cold (for the July, -5 C/+23 F degrees). Nevertheless, the sky was really brilliant when it was clear - I saw M13, M33 and M8 with a naked eye; NGC6960 and NGC 6992 could be easily seen via 15x70 binoculars. About Meade LT-8 SC - yes, it is not for taking pictures, but you can take ones, if you wish. And not every telescope is so reliable - my LT-8 endured cold, rain and even snow and it nevertheless worked perfectly. No Audiostar errors at all. Yes, the LT is a really rugged scope, which is what you need. I really like your image of the Lagoon Nebula! The elevation seems to have helped you show the outer portions of the nebulosity very well. Your group looks like one that would fit in rather well with a bunch of people I know over here, or maybe the other way around. Something tells me you had a great time. (ISO 1600, 1/30 s exp, 40 s x 25 f/s, 53 frames stacked in the Registax) I cannot say this pic of Saturn is perfect, but there was really strong wind and it was very hard to focus my telescope properly. In any way, I have some important conclusions about LT-8 for viewing and imaging, and the most important one is the rather long time of termostabilization. The longer your telescope will be waiting on the open air - the better quality of picture you'll get in the eyepiece as a result.